Airmen should be careful when taking dietary supplements — because of the potential health risks, but also because they could lead to a positive urinalysis test result, according to officials with Air Force Reserve Command’s Medical Services Directorate and staff judge advocate’s office. Dietary supplements are intended to provide nutrients that may otherwise not be consumed in sufficient quantities. The most common supplements are vitamins. Other popular supplements promise help in gaining or losing weight, or in improving athletic or sexual performance. Jenrette said he and his DDR specialists in the field are often asked if there is a list of dietary supplements that are banned or illegal for use by military members. He said that Air Force Instruction 90-507, “Military Drug Demand Reduction Program,” specifically bans any supplement that contains hemp and hemp seeds or hemp seed oil, but there is not a comprehensive list of banned supplements by name. He did say, however, that the Defense Department is clear about what substances are banned for use by U.S. military service members. Educational training is available to civilians and their supervisors in advance of the Air Force’s April 2017 transition to the new Department of Defense-wide Performance Management and Appraisal Program. A phased implementation of DPMAP, part of the DOD’s collaborative labor-management effort, New Beginnings, began in April 2016 with a limited number of Army, Navy and defense agency civilians. Department of the Air Force civilians are part of phase II with the first annual appraisal period beginning April 1, 2017, and closing March 31, 2018. Training options include either the six-hour web-based training via Joint Knowledge Online, a 14-hour in-resident class, or a combination of the two. Training must be complete for transition into DPMAP. The online JKO training is available under course numbers PM101A for part one, and PM101B for part two. While the online training is available now, employees will receive further information when DPMAP training is scheduled for their base. “The new program will bring some administrative changes, but the key tenet of our current civilian evaluation system will be retained — individual performance will be linked to organizational mission and goals,” James said. 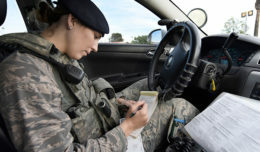 Additional Air Force training related to DPMAP and New Beginnings, expected in the fall, includes a performance management coaching program that will provide short, facilitated, interactive learning opportunities. Just as literacy in reading and writing is critical to processing information in day-to-day life, health care has its own component of literacy. Health literacy is the capacity of individuals to obtain, process and understand health information and services in order to make informed decisions about their health. Many factors can determine a person’s health literacy. Familiarity with medical terms or having an understanding of human body functions can affect a person’s ability to fully comprehend health information. Patients often find themselves in positions to interpret numbers or even take risks to make a health care decision. Some have complex medical conditions that require intricate self-care. Patients who are diagnosed with a serious illness could be scared or confused, severely hampering their ability to understand their care. At the core of health literacy is communication between patients and their health care providers. In order to make the best decisions about their health, patients need clear information they can understand. Through patient-centered care, the Air Force is working to educate health professionals to become better communicators. Easy-to-read signage, a well-thought-out floor plan and careful furniture placement can enhance the patient experience. Health care providers rely on health literacy to help individuals find appropriate health information and services, communicate about patients’ health, process patients’ needs and requests, and determine the best health care options to help patients manage their health. The Air Force is accepting nominations to fill its first class of enlisted remotely piloted aircraft pilots as part of a deliberate approach to enhance the intelligence, surveillance and reconnaissance mission. The first enlisted RPA pilot selection board will convene at the Air Force Personnel Center from Jan. 23 through 26, 2017, with application packages due to AFPC by Nov. 18. The selection board process mirrors that of the Undergraduate Flying Training program and allows candidates time to complete all eligibility requirements. Applicants must be staff sergeant through senior master sergeant from the 1A and 1U career fields and have six years of retainability upon course graduation. “We have an incredibly talented pool of enlisted Airmen, and we’re confident that a rigorous selection process will yield excellent enlisted aircrew who will continue to provide combatant commanders with the ISR they need to win today’s fight,” Rigby said. The end goal is to have the Global Hawk enterprise manned by a majority of enlisted pilots in day-to-day operations with key leadership positions filled by officers experienced in the ISR mission set.